Sheboygan is a city in Sheboygan County, Wisconsin, on the shores of Lake Michigan. Cheboygan is a city in Cheboygan County, Michigan, on the shores of Lake Huron. There are a few nice venues in both towns, but we’re going to compare the Cheboygan Opera House to the Stephanie H. Weill Center for the Performing Arts in Sheboygan. We’ve been to the Weill Center for concerts in the past and found it to be an extraordinary old venue. However, there was a guy outside the Cheboygan Opera House who aggressively confronted us and told us how beautiful it was inside. Both cities have what we’ve been calling “lighthouses,” but this is apparently incorrect. The Cheboygan Crib Light looks like a small lighthouse, but because it doesn’t have housing within its structure, it’s not technically a lighthouse. The Sheboygan Breakwater Lighthouse is a big, actual lighthouse. We think. We realize there are multiple points of entry to both cities, so we may not have seen the best signs of this category for both. That said…come on, THE citizens of Sheboygan! Get over to Maple Lanes and practice a little. Like the city limits signs, people do notice these things! We don’t, but we’re sure some people do. While the wastewater seemed equally treated in both cities, we can’t help but notice whose facility is and whose facility isn’t located directly next to Vollrath Park and a completely amazing disc golf course. Cheboygan’s Daily Tribune was founded in 1876. The Sheboygan Press was founded in 1907. The Sheboygan Press once published a photo of Milwaukee Record‘s Josh Hoppert swimming in Lake Michigan on New Year’s Day. The Cheboygan Daily Tribune front page features an illustration of their Crib Light that we’re not allowed to call a lighthouse. Driving around both communities, it’s easy to see that local shopkeepers are proud to align themselves with the town they call home. This is awesome. Both cities have MUCH to be proud of. That said, only one city has a laundromat sign that we’d all love to have hanging in our homes. Fond as we are of food (too fond, really), it’s tough to beat a Cashmere Hammer in 3 Sheeps’ Taproom. Would we seriously drive all the dam way to the dams in both dam towns just so we could make a bunch of dam jokes about the damn dams, a la Vegas Vacation? Never. 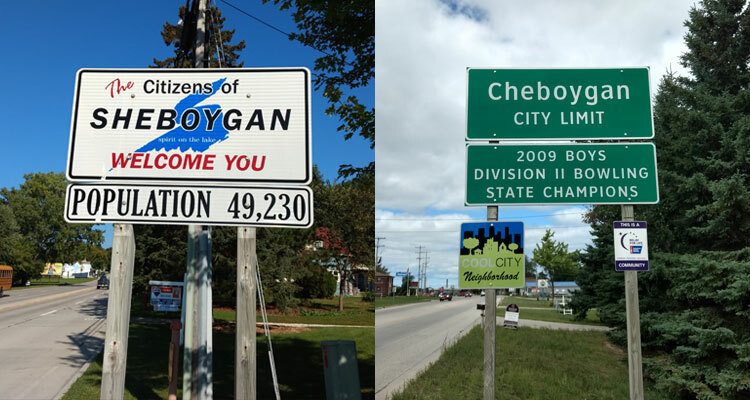 We feel a little bad for what we said about Sheboygan’s city limits sign earlier, so this is kind of a make-up category. Nothing against the City of Cheboygan Public Works facility we happened to snap a pic of, but the Municipal Service Building in Sheboygan is just objectively cool-looking. Our panel of judges spent more time on this category than any other. All agreed that Randall’s offers better (butter) burgers than Big Boy, but all also agreed that the classic look of the Cheboygan water tower trumps the sexiness of the (Town of) Sheboygan tower. It was a tough and emotional decision. Outside the Cheboygan Wastewater Treatment Plant, we caught a glimpse and a bad photo of Cheboygan’s flag. Does it follow the principles of good flag design? Probably not, but shut up. It’s nice and informative and has the Crib Light on it. Sheboygan’s flag has a big blue swoopy S on it.